MERRITT ISLAND, Florida – SeaWorld Orlando's animal rescue team traveled to Skykes Creek in Merritt Island, Florida, this afternoon to rescue a 10-foot manatee. The manatee had severe injuries to its front right flipper caused by crab pot line. Fishing line was also wrapped around both of its front flippers. 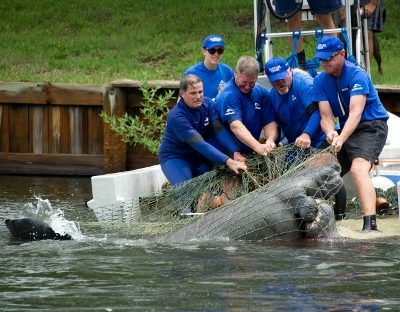 The adult, weighing nearly 1,400 pounds, was transported by the rescue team to SeaWorld Orlando for further evaluation and care. After assessment, its front left flipper was amputated and bandaged. The manatee is currently in guarded condition and is receiving antibiotics.